Ralls × Delicious, Tohoku Horticultural Research Station, Morioka, Japan, first selected in 1939 as Tohoku 7, named Fuji and introduced in 1962. Medium vigour, straggly with long weeping branches. Resistant to scab, some resistance to powdery mildew. Medium, 575 hours; red strains similar. Granny Smith, Delicious, Bonza, Gala, Golden Delicious; red strains similar but will not cross-pollinate each other. Medium but can be smallish, flat conical. Pink-red striped on 50–80% of surface; can look dull. Excellent eating quality, yellowish, firm, crisp and juicy with lots of flavour. 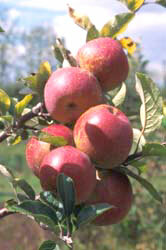 2–3 weeks after Delicious, before Granny Smith; red strains similar. Can be very biennial and needs some crop regulation for size as well as return bloom. Long; red strains similar; scalds. Aki Fu No. 1 - Medium, less flat and more conical than Fuji, less colour than others, may be firmer thanFuji. Aki Fu No. 7 - Medium, less flat and more conical than Fuji, more variable than Naga Fu selections, sometrees showing promise, bright pink-red colour, may be firmer than Fuji. Naga Fu No. 1 - Medium, less flat and more conical than Fuji, similar to Naga Fu 2 but with less colourand more semi-striped; may be firmer than Fuji. Naga Fu No. 2 - Medium, less flat and more conical than Fuji, probably best colour so far, mostly solidred; can russet, especially on young trees; may be firmer than Fuji. Naga Fu No. 6 - Striped selection of Naga Fu 2, medium red and broken stripe, less susceptible to russetthan Naga Fu 2, prone to reversion. Naga Fu No. 12 - Striped selection of Naga Fu 2, may suit warmer districts, dull inconspicuous red stripe,more susceptible to russet than Naga Fu 6.